CENTRED HIGH AND SLIGHTLY TO RIGHT. LIGHT OVERALL TONING (BROWNISH GUM PLUS A HINT OF HINGE TONING). FAIRLY LIGHTLY MOUNTED (APPROX. OTHERWISE VERY NICE EXAMPLE WITH MINIMAL GUM CREASING AND GOOD CLEAN CONDITION (CAT. ). FAIRLY WELL CENTRED (SLIGHTLY HIGH). LIGHT OVERALL TONING (BROWNISH GUM). VERY LIGHTLY MOUNTED WITH ONLY SLIGHT TRACE OF HINGE REMAINS. SLIGHT HINT OF GUM CREASING ON LEFT AND RIGHT EDGES, OTHERWISE VERY NICE EXAMPLE IN GOOD CLEAN CONDITION (CAT. ). It is the 1938, 1s Black & Green stamp. 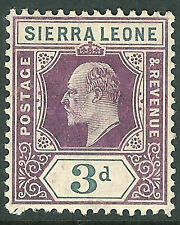 Good condition stamp of Sierra Leone. 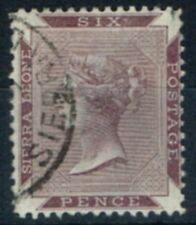 Sierra Leone 3d Stamp c1904-07?. Mounted Mint (1162 ). 1890 6d Brown-Purple SG36. Sierra Leone. Year of issue: 1890. Fine Mtd Mint. Grade: Fine. Occasionally we all make mistakes, and if we do we fix it. Condition: Mint Hinged. Newly Listed/New Arrivals. 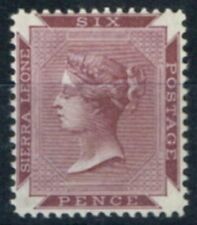 Sierra Leone 1912 blue/dull-purple £2 very lightly mounted mint SG129 Cat £950 couple of short perfs at top otherwise fine. 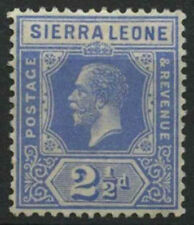 Sierra Leone 1932 George V 5/- Deep blue SG165 -Mounted Mint. Year of issue: 1872. Occasionally we all make mistakes, and if we do we fix it. Condition: Mint Hinged. Newly Listed/New Arrivals. Commonwealth & Empire. Collections & Mixtures. 1885 6d Dull Violet SG35. Year of issue: 1885. Sierra Leone. Fine & Fresh Mtd Mint. Grade: Fine. Occasionally we all make mistakes, and if we do we fix it. Condition: Mint Hinged. Era: Queen Victoria (1837-1901). 1905 3d Dull Purple & Grey SG91. Sierra Leone. Year of issue: 1905. Fine Mtd Mint. Grade: Fine. Occasionally we all make mistakes, and if we do we fix it. Condition: Mint Hinged. Era: King Edward VII (1901-1910. ). One or two quite minor little handling wrinkles, but otherwise a facially unmarked 1912 halfpenny value. S Leone SG 132,133,140,142 m/mint. 1908 2s Purple & Brt Blue-Blue SG109. Sierra Leone. Year of issue: 1908. Fine Mtd Mint. Grade: Fine. Occasionally we all make mistakes, and if we do we fix it. Condition: Mint Hinged. Newly Listed/New Arrivals. Year of issue: 1897. Sierra Leone. Occasionally we all make mistakes, and if we do we fix it. Condition: Mint Hinged. Era: Queen Victoria (1837-1901). Price: £15.00. It is the 1953, Coronation stamp. 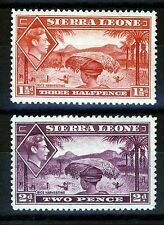 Good condition stamp of Sierra Leone. 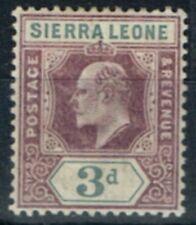 Sierra Leone 3d Stamp c1903?. Mounted Mint (1161 ).